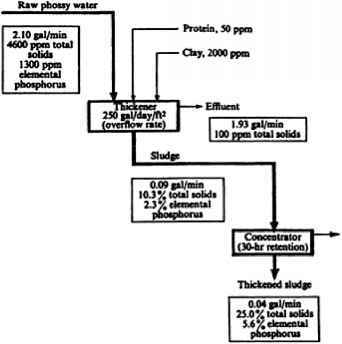 Figure 12 Summary of materials balance in a pilot plant for recovery of phosphorus from phossy water (from Ref. 15). 1 ppm=1 mg/L. dissolving phosphorite in the manufacture of normal superphosphate. These constituents are removed from the acidic and highly toxic gases by washing with water or brine in closed condenser equipment, and the wastes from this process are usually slightly acidic, clear, and colorless. The production of superphosphate is often combined with the manufacture of sodium fluorosilicate and then the amount of wastes is larger. 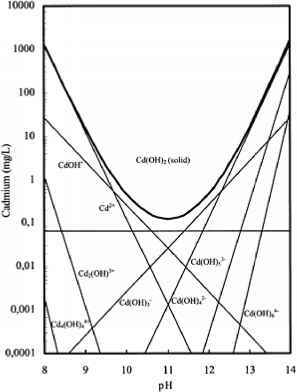 Czechoslovakian experiments have shown that for every 1000 tons of superphosphate (20% P2O5 content) produced, 133 m3 (4700 ft3) of postcrystallization liquor from the crystallization of sodium fluorosilicate and 67 m (2370 ft3) of washings are discharged. The liquor contains 20-25 g/L NaCl, 25-35 g/L HCl, 10-15 g/L silisic acid, and 8-10 g/L sodium silicofluoride. For this waste, the most significant aspect of treatment is recovering the sodium silicofluoride from the brine used to absorb fluorine compounds from the gaseous waste streams, and this is relatively easy to accomplish since it settles nearly ten times as fast as silicic acid gel and, therefore, it is separated by sedimentation. The silicofluoride recovered is a valuable byproduct that, following filtration, washing with water, and drying, is used as a flux in enamel shops, glass works, and other applications. In Czechoslovakian phosphate fertilizer plants, the superphosphate production waste-waters are further treated by neutralization on crushed limestone beds contained in special tanks that are followed by settling tanks for clarification of the wastewater. The beds have from three to five layers (with a minimum bed height of 0.35-1.60 m), treat a range of acidity of wastes from 438 to 890 meq/L, and are designed for a hydraulic load ranging from 0.13 to 0.52 cm3/ cm2 s (1.9-7.7 gpm/ft2) at operating temperatures of 20-28°C. This experience agrees with results reported from Polish plants, the limestone used contains 56% CaO, and it was found in practice that coarse particles of 3-5 mm give better results because less material is carried away. In the former USSR, superphosphate wastes were neutralized with powdered limestone or milk of lime. The neutralized wastes leaving the settling tank contain primarily dissolved sodium and calcium chlorides. As previously mentioned, the manufacture of phosphate fertilizers also yields large quantities of phosphogypsum, which often contains significant amounts of fluorine and phosphorus compounds and requires large areas for dumping. It has been estimated that for each ton of phosphorite processed, a wet process phosphoric acid plant yields 1.4-1.6 tons of gypsum containing about 30% water and 66% calcium sulfate. 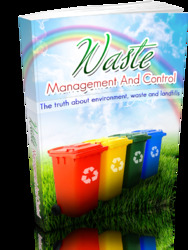 This waste material has been used for the production of building materials such as plasterboard, ammonium sulfate, but primarily sulfuric acid and cement.